Applying this product to paw pads helps to prevent pets from slipping on streets with poor conditions (snow, ice, etc. ), on bare flooring, in contest arenas, or in other slippery environments. 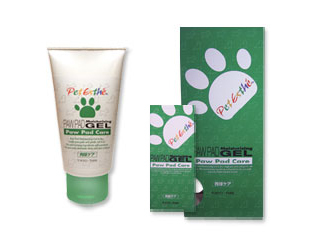 This is a moisturizing gel to be used when paw pads have become dry and rough or during periods when the surface tissue in paw pads tends to become hard, such as the dry winter season. For best results, use daily. Sodium hyaluronate, aloe extract, squalane, green tea extract, eucalyptus oil, orange oil (deodorizing agent).